Mid-day in the Mara can be extremely hot, and this was true of today. The sun was pumping its rays down onto the land and the horizon was dancing. Our tent was situated right on the south bank of the Talek River, and the opposite side of the river was home to more than 20 Masked Weaver Birds. As the sun pounded down, I sat under a tree on the river’s edge watching the Weaver Birds work away, all were franticly building new nests to attract a mate. Starting with two branches, the six inch tall, black faced and bright yellow coloured Masked Weaver ties together the foundation of his nest. With selectively picked lengths of grass, he wraps the grass around the first branch and skillfully ties the grass to the branch. With the two branches providing a frame to work from, he starts to weave a ring of grass between them. Once a ring is formed, the outer structure can be built and worked into the unmistakable Weaver Bird’s nest. Without counting each blade of grass, I would estimate there being close to a thousand blades of grass in a completed nest. It’s non stop work for the Weaver Bird and after each blade is threaded into place he flies off to select another blade. It must take several days to make a fully formed nest, I watched the same bird for about an hour and he tied a blade of grass every 2 – 3 minutes, he must have tied more than 35 blades in the time I spent watching him. 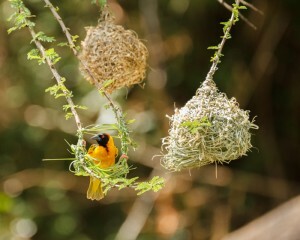 Its was fantastic watching our Masked Weaver build his home. The agility and skill this tiny bird has developed to engineer such a perfect structure is amazing and the finished nest is a work of art! All I could do was hope his work was not in vain, and once finished his mate would approve, otherwise he would have to start all over again!